Ansari Transformers is a family of Software Embedded Hardware Electronics expert people, in the field of Power conditioning, manufacturing Domestic and Industrial Inverters, Online and Line interactive UPSs and Custom built Chargers. Established in the year 2004, Ansari Transformers Electronics ( India) is one of India's most reputed manufacturers and exporters of UPSs & Inverters. Ansari Transformers Electronics has emerged as a leading brand name to reckon with in the manufacture and export of high quality inverters. We have set benchmarks for our competitors on the lines of quality and finesse. We offer premium quality products to give our clients excellent services and true value for money. 5. Inverter mode protected against overload short circuit, reverse phase and unbalanced load. 7. Automatic low battery warning and cut-off. 9. Charging current can be varied from 2 am To 12 amp. 4. Charger based on four stage algorithm (Boost, Absorption, Float and Reset). 10. 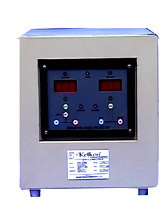 Soft start inverter mode for cold starting inductive loads. 11. Compact double sided PTH design. 1. Frequency is 50 Hz and hence enhance out put voltage have the electronic gadgets are sage which are works on it. 5. Manufactured on world class machinery by fully automatic process. 1. After every 15 days water level in every cell should be checked(checked all the six caps) and topping of required may be done by adding distilled or clean filtered water only. 2. On failure of main supply please checked the main fuse cap and change the fuse for inverter, U.P.S. 3. On failure of charging please check the charging fuse cap and change the fuse for inverter, U.P.S. 4. Terminals please keep clean of the battery terminals after every 15 days. 5. On failure of the function of the inverter, please off the main and inverter switches of fronts side and down the back side switch on by pass position. Please consult a authorize dealer/firm decide whose rating product fulfils and suit your needs and choice. AN ISO 9001 2000 certified company.